Construction on the church began in 1844 after a small group of individuals met early in that year and agreed to establish an ecclesiastical society that would become the Church of the Pilgrims. The group hired Richard Upjohn, a prominent architect well known for Gothic churches for Episcopal congregations, to design the church. In contrast to his Gothic-style work, Upjohn designed the first Romanesque Revival church in the United States, one which has been termed a medieval equivalent of a New England meetinghouse. 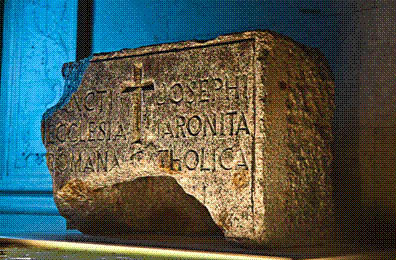 The cornerstone was laid on December 22, which was the 224th anniversary of the landing of the Pilgrims at Plymouth, 71 people assented to the articles of faith and were recognized as a Church of Christ. Construction continued through 1845 and the church held its first public services on May 12, 1846. The church cost approximately $65,000, including $10,000 for the land, and exceeded the initial budget by about $13,000. Construction was hampered when it was determined that the timbers supporting the roof were inadequate. As a result, a truss bridge was added. Additionally, side galleries not included in the initial design were also built, which significantly increased the church’s seating capacity. In the 1850s, ten columns were added to further support the roof. In 1869, construction commenced on an addition designed by Leopold Eidlitz who had once worked for Richard Upjohn. The addition provided an additional 450 seats in the church, a larger lecture room, and rooms for classes and meetings. Funds to cover the $128,000 project were raised in a mere three weeks. As the population of Brooklyn Heights changed in the early twentieth century, the number of members of the Church of the Pilgrims and neighboring Plymouth Church declined. Both congregations reassessed their positions within the community and, in 1934, the Church of the Pilgrims merged with Plymouth Church to form Plymouth Church of the Pilgrims. The Maronite community in New York dates back to 1890 and began in a rented hall at 127 Washington Street in Lower Manhattan, known as Saint Joseph’s Maronite Church. Arriving in New York in 1900, Father Khairallah Stephen (Estephan) founded Saint Joseph’s, relocated at 81 Washington Street. In 1902, Father Stephen used $2000 of his own money and $600 in donations to purchase a large brownstone at 295–297 Hicks Street in Brooklyn. The Certificate of Incorporation of “The Roman Catholic Church of Our Lady of Lebanon” was signed on February 17, 1903, and was recorded in the Office of the Clerk of King’s County on March 3, 1903. Church services began in Brooklyn in 1904. 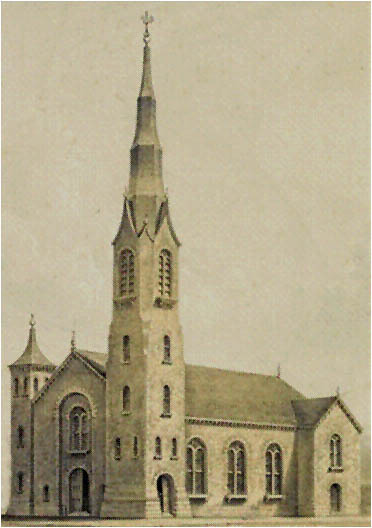 Although the church was initially on the main floor (with the rectory above), the basement and main floor were subsequently combined, and the renovated church was dedicated as Our Lady of Lebanon Church in January 1906. The Brooklyn Maronites, who were mostly from Aleppo, Syria, formed the core of the new parish. Over time, many Manhattan Maronites, who were predominantly from Lebanon, relocated to Brooklyn to be closer to the Church. Due to the growth of the Brooklyn Maronite community, the search for a new church began in 1938. On December 8, 1943, Father Mansour Stephen (the nephew of Father Khairallah Stephen) signed a contract to purchase the former Church of the Pilgrims (Congregational) at the southeast corner of Henry Street and Remsen Street in Brooklyn Heights for $70,000. The sale was completed quickly and the deed was recorded on February 1, 1944. The Maronites officially took possession of the property on February 9, 1944, the Feast of Saint Maron. The first Divine Liturgy was celebrated on Sunday, November 26, 1944, by Father Mansour Stephen, when the new church of Our Lady of Lebanon was dedicated. The brownstone residence immediately adjoining the Church at 113 Remsen Street was purchased on December 30, 1944 through the kind generosity of a parishioner, Mr. George Jebaily, later a Papal Knight. Four of ten bronze medallions from the luxury ocean liner Normandie, on the Remsen Street entrance to the church. As part of the work undertaken to renovate the Church, Father Stephen purchased a pair of bronze doors from the Normandie, a famed French luxury liner, with 10 great medallions. Nine of the medallions show Norman cities, and one shows a sister ship, the Ile de France. The medallions had to be rearranged because the doors did not fit the church openings. 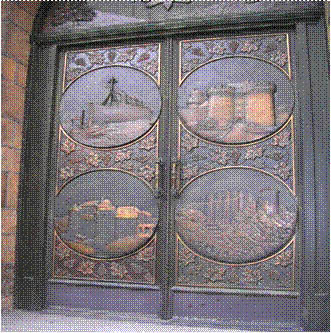 Six of the medallions are located at the Church main entrance on Henry Street, while the remaining four medallions (including the Ile de France) are located on the smaller Remsen Street doors. In addition to the doors, the windows were replaced because the original stained glass windows were brought to Plymouth Church of the Pilgrims. Upon hearing of a new colored glass window method developed by French artist Jean Crotti, Father Mansour sought to have the Church become the first in the world to have all windows made in the “Gemmaux” method. 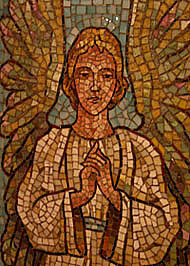 Crotti, in 1953, undertook the year-long work to create ten pictorial windows for the Church in his French workshop. 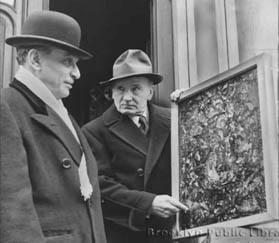 Artist Jean Crotti with Chorbishop Mansour Stephens reviewing cartoons for the proposed church windows. Problems developed with the windows created by Crotti, so in the late 1950s the Lebanese artist Saliba Douaihy came to Brooklyn to work on the existing stained glass windows as well as to produce a new set for the lower portion of the Church. Douaihy set up a spacious studio in a loft of the Church, which is today where the Chancery is located. In addition to the windows, behind the altar, Douaihy painted a large mural of Our Lady of Harissa standing at the top of the Lebanese mountains looking down on the coast and sea. On June 27, 1977, Our Lady of Lebanon Church was designated as the Cathedral of the Diocese of Saint Maron – U.S.A., when the Eparchial See was transferred from Detroit, Michigan to Brooklyn, New York. In 1994, the new Eparchy of Our Lady of Lebanon of Los Angeles was created by the Holy See, and the remainder of the original Diocese of Saint–Maron – U.S.A. became the Eparchy of Saint Maron of Brooklyn. Since its designation as the Cathedral, Our Lady of Lebanon has served all three of the Bishops of the Eparchy of Saint Maron: Archbishop Francis Mansour Zayek (1966–1996); Bishop Stephen Hector Doueihi (1996–2004); and currently, Bishop Gregory John Mansour (2004–present). The Rev. 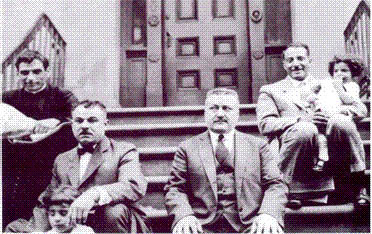 Mansour Stephen (far left) on the steps of Our Lady of Lebanon when located on Hicks Street with parishioners. In parallel to Our Lady of Lebanon, Saint Joseph’s continued its mission among the Manhattan Maronites, purchasing property at 57–59 Washington Street in 1910. However, as early as 1902, the Maronite population of Manhattan was decreasing as the immigrants prospered and their children grew up and moved out of lower Manhattan. By the late 1930s, Saint Joseph’s had a very small congregation of Maronites in the immediate neighborhood of the church. On February 5, 1946, the City of New York acquired title to the 57 Washington Street property in connection with the construction of the Brooklyn Battery Tunnel. Saint Joseph’s Church moved to 157 Cedar Street, which, after extensive remodeling, was in use by May 1949. In December 1966, the Archbishop of New York suggested that Saint Joseph’s Church be suppressed as a Maronite parish so as to promote the founding of a new Latin parish in the area to meet the needs of the predominantly Latin Catholics who would work in the World Trade Center, then in the final planning stages. After several years of consultation, the Saint Joseph’s Church property was sold to the Archdiocese in April 1969, after being assured that the Maronite Liturgy could always be celebrated at Saint Joseph’s Church. However, soon thereafter, the property was taken again by eminent domain, this time for construction of the World Trade Center. The church was relocated for the third time, and continues today as Saint Joseph Chapel, one block to the West of the Cedar Street location, at 385 South End Avenue (the church entrance is on Liberty Street) and is administered as part of Saint Peter’s Catholic Church on Barclay Street. Richard Upjohn was one of the most prominent church architects in the United States in the 1800s. Born in Shaftesbury, England in 1802, his father had thought Upjohn would become a priest, but instead the young Upjohn apprenticed to be a carpenter and eventually opened his own business as a cabinet maker. He emigrated with his family to the United States in 1829. After gaining notoriety in Boston, he relocated to New York in 1839 where he designed a number of important churches that still stand today. He initially came to New York to design Trinity Church Wall Street in Lower Manhattan. In addition to Church of the Pilgrims, he also designed Grace Church (Episcopal), located nearby on Hicks Street. Upjohn helped found the American Institute of Architects in 1857 and served as its first president until 1876. He died in Garrison, New York, in 1878.